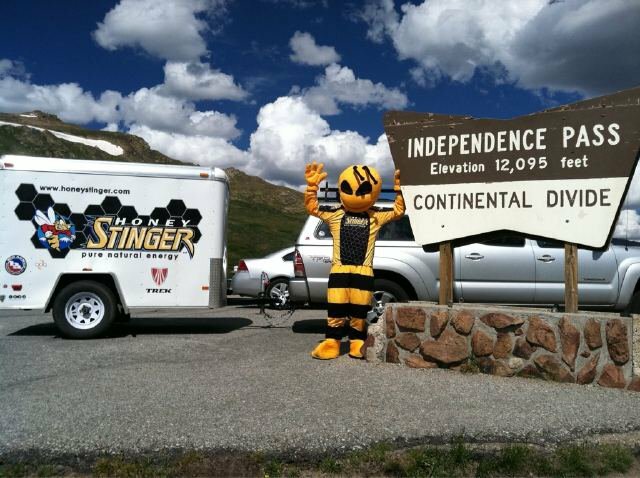 Honey Stinger is extremely excited to announce they are the official feed zone sponsor of the USA Pro Cycling Challenge. The Colorado-based energy food manufacturer will provide samples from its diverse line of products to help fuel competitors during 683 miles of high-altitude racing. “The best cyclists in the world are coming back to tackle the most beautiful and challenging riding in Colorado and having Honey Stinger, a local Colorado company, fueling our competitors is integral to showing off the best that our state has to offer,” added Shawn Hunter, CEO of the USA Pro Challenge. Honey Stinger will supply product samples and musette bags to teams traveling from abroad and others that need it for each feed zone along the route, fueling the race’s elite competitors with honey-based nutrition. In addition, the company will sample and sell its nutritional products and logo-wear each day at the finish area expo zone and provide samples in the press room for members of the media. Located in Steamboat Springs, Colo., Honey Stinger makes convenient, nutritious and great tasting honey-based foods including energy bars, protein bars, energy gels, organic waffles and organic chews. Fueling some of the country’s top cyclists, runners, triathletes and teams, including co-owner Lance Armstrong, Honey Stinger products may be found at specialty sporting goods retailers, natural food grocers and www.honeystinger.com. For seven consecutive days, the world’s top athletes race through the majestic Colorado Rockies, reaching higher altitudes than they’ve ever had to endure as they ascend over three mountain passes, each exceeding 12,000 ft. in elevation. After attracting more than 1 million spectators in 2011, making it one of the largest cycling events in U.S. history, the USA Pro Challenge is back for 2012. Featuring a challenging, 683-mile course with more than 42,000 ft. of vertical climbing, the second annual race will spotlight the best of the best in professional cycling and some of America’s most beautiful scenery. Referred to as “America’s Race,” the USA Pro Challenge will take place August 20-26, 2012, a week proclaimed by Governor John Hickenlooper as “Colorado Cycling Holiday,” and travel through 12 host cities from Durango to Denver. More information can be found online at www.ProChallenge.com and on Twitter at @USAProChallenge. This entry was posted in Company News and tagged Press Release, USA Pro Cycling Challenge. Bookmark the permalink. Hey. Where is the feed zone for stage 6 of the pro tour challenge?